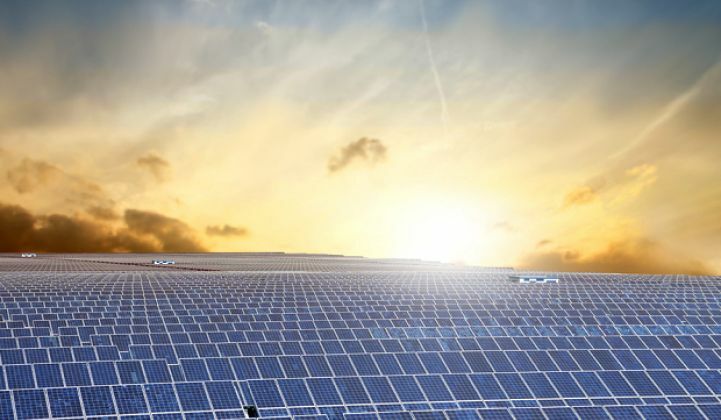 After a record-breaking 2015, GTM Research expects the global solar PV market to grow 21 percent and add 66 gigawatts of capacity by the end of the 2016. 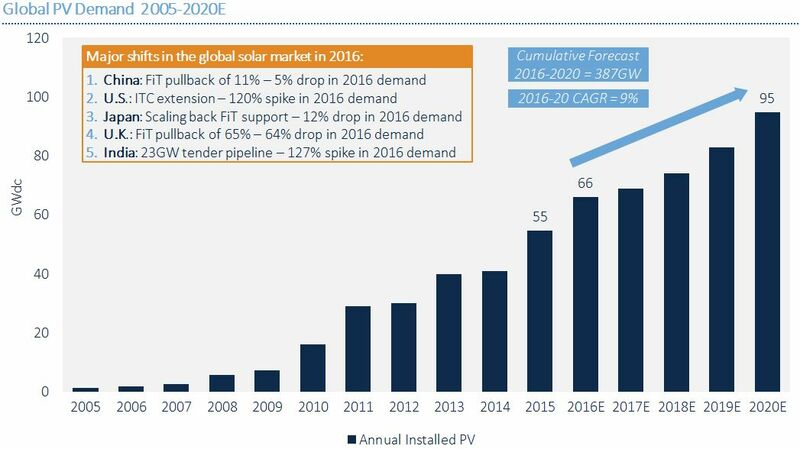 Tempered by policy pullbacks across major markets China, Japan and the U.K., PV growth will slow in 2017, but the market will reach 95 annual gigawatts by 2020. Below are some of the key trends GTM Research identified in its new report, Global Solar Demand Monitor: Q2 2016. To date, 13 countries have installed at least 2 gigawatts of PV capacity. According to the report, that number will grow to more than 20 by 2020. Europe, once the stronghold of the global market, will see its top markets continue to fall down the rankings in the short term. However, GTM Research expects a turnaround for the region. 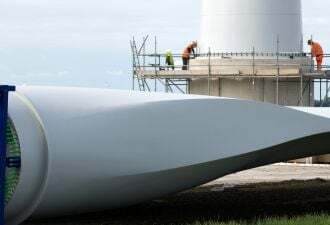 Its share of installations will grow from 10 percent this year to 13 percent by 2020. GTM Research expects India to solidify as a major market, growing from 4 percent of the global market in 2020 to 13 percent by 2020. 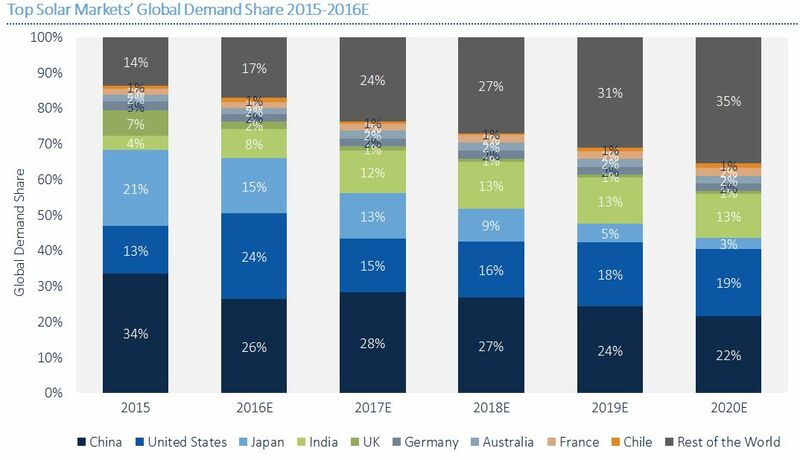 That means India will install just as much solar in 2020 as all of Europe. While it has a small base, Latin America will impressively double in size this year. Mexico's recent auction results have positioned the nation on-par with Brazil as the two most promising regions in Latin America. 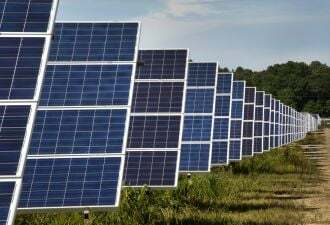 As the price of solar continues to fall, the report notes that the number of countries using auctions as a mechanism to drive solar installations has significantly increased. GTM Research identified 14 countries using auctions in 2014, and today that number has grown to 22. Feed-in tariffs, however, look to be going out of fashion as the number of countries using the mechanism dropped 14 percent in the same time period. 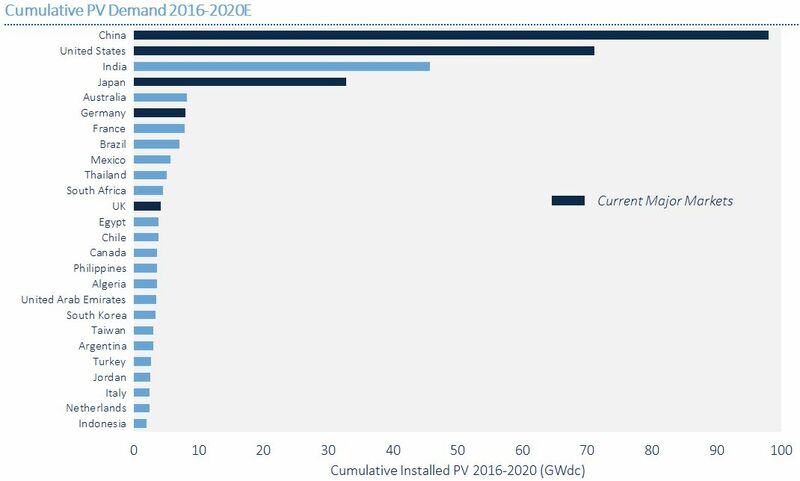 Utility-scale installations will account for 61 percent of all PV installed in 2016. 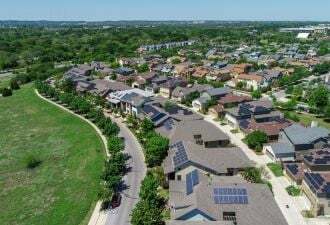 "The gap between utility-scale solar and distributed generation (DG) has shrunk in the past two years as residential growth in the U.S., Germany, the U.K., and Japan has picked up," says the report. 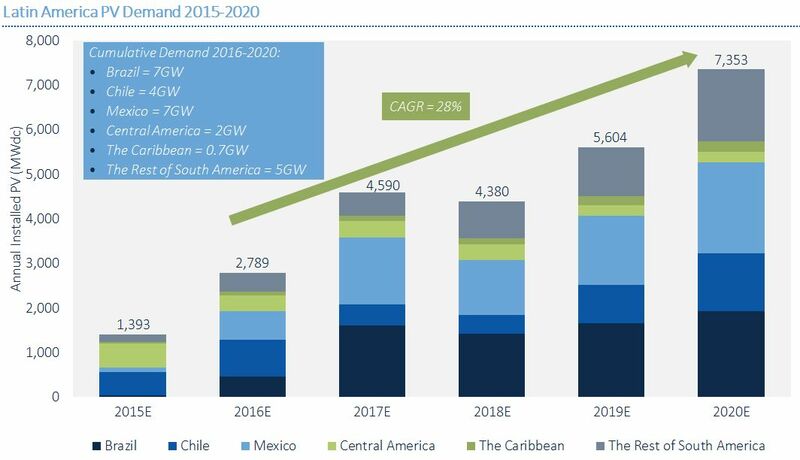 "DG growth will continue to be driven by greater end-customer familiarity with solar, higher cost-competitiveness, and country-tailored business models that build on leasing’s success in the U.S. but are adapted to the specific needs of emerging markets. Download the report's free executive summary here.